(Nanowerk News) The wide bandgap energy and high optical absorption coefficient of oxide photovoltaic devices are attractive properties for next generation thin film device applications, especially as top cells in high performance multi-stacked solar cells. However, the conversion efficiency oxide photovoltaic devices is low compared with theoretical estimates with the result that current commercial solar cells are produced using Si and Cu(InGa)Se2. Here, in an international collaboration between Toyohashi University of Technology (Toyohashi Tech) and Centre National de la Recherche Scitenfique (CNRS), Ecole Nationale Superiure de Chimie de Paris (ENSCP), ZnO nanowire (NWs) were used to expand the active layer in the Cu2O light-absorbing layer and in the highly resistive i-ZnO layer to reduce the recombination loss at the heterointerface of ZnO/Cu2O photovoltaic devices ("Electrodeposited ZnO—Nanowire/Cu2O Photovoltaic Device with Highly Resistive ZnO Intermediate Layer"). Integrated circuit with ZnO nanowires. 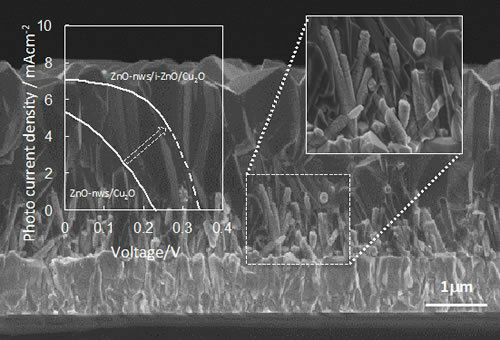 The ZnO-NWs was electrodeposited onto a transparent conductive glass substrate at CNRS, and then i-ZnO and Cu2O layers were electrochemically stacked onto the ZnO-NWs at Toyohashi Tech for complete the fabrication of a photovoltaic device. The introduction of the ZnO-NWs and the i-ZnO layer yielded an increase in the short circuit currenrt density and an improvement of the conversion efficiency of solar cells to 1.26 % which is higher than the 0.47 % reported today. The results demonstrate show the importance of the heterointerface on the performance of oxide photovoltaic devices as solar cells.